Ford V8 stationery relating to their French subsidiary in the 1930s. Homepage. This page: A rare item of paperwork relating to Ford's car-building activities in France. Ford cars in Asnières-sur-Seine, France. 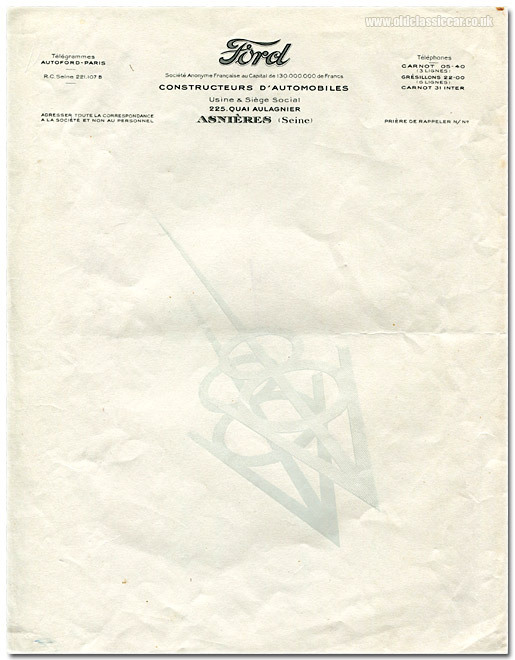 This unused sheet of factory stationery relates to Ford's French-based operation in the early 1930s, known at the time as Ford Société Anonyme Française. The subsidiary can trace its French roots back to 1916 when, as Société Française des Automobiles Ford, it began to produce the Model T under licence at a plant in Bordeaux. This continued until 1925, then switched to a facility in Asnières-sur-Seine, the address given on this old letterhead, where Model Ts continued to roll out of the door until 1927. Production of the American Model A took over from the T until 1931, followed by the building of the Model Y Ford, an 8hp model built at Dagenham but of American styling. In parallel, the company also built up the short-lived, V8-engined, Model B (or Model 18 as the eight-cylinder rather than the four-cylinder version was officially known), but it didn't prove popular, in part due to the import taxes levied upon each vehicle sold in France. By 1934, the final year for Model 18 production, it was time for a change of direction, and Ford would enter into a collaboration with Mathis, producing cars under the Matford name. I think that this item of paperwork dates to the period of Model B/18 production, ie 1932 to 1934, due to the presence of the V8 symbol printed onto the paper. Below "Constructeurs d'Automobiles" - Car Makers - the heading says "Usine & Siège Social" which translates to Factory and Head Office, located at 225, Quai Aulagnier, Asnières (Seine). Telephone numbers are given, as is the company's telegram address: Autoford-Paris.